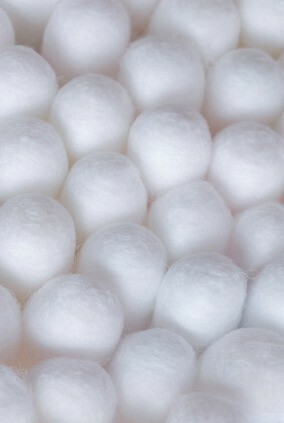 Many of us use cotton balls daily for makeup removal in addition to other uses. This is a guide about saving money on cotton balls. I am now saving the cotton that is packaged in vitamin and other bottles. These small pieces found at the top of the bottle can be used as cotton balls for removing nail polish or other similar applications. Don't you hate how cotton balls leave fuzz on your face or get so soppy it takes more than one to do the job? Try this: Cut little squares of fabric and run them through your sewing machine, zig-zag the edges. I find SOCKS make the best ones. The fabric is a little heavier, they are absorbent, and wash well. To wash them, put them in a net bag and throw in with the towels. This takes a little bit of time at the outset, but once you have a bunch of these made up, you will find them so much nicer to use. Naturally, these aren't sterile, so use your own judgment on what you use them for. You wouldn't use them to dress a wound, but for uses like applying makeup or astringent they work really well. I ripped up an old flannel shirt and didn't bother to hem the ones I use with nail polish remover, glue, etc. Then these can just be thrown away. Even though you toss these, it's still better than buying cotton balls because you can always find a scrap of old fabric to use.